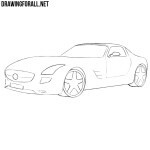 Do you want to learn how to draw a Mercedes AMG GT? Then this drawing lesson is specially for you! 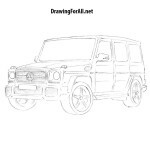 If you often visit our site then you already know that we very much like to draw Lamborghini and Mercedes, and we already have drawing lessons about S Class and Gelandewagen. So, as always, we start with the body of our vehicle. Using very light and almost transparent lines let’s draw the basic outlines of our Mercedes AMG GT. We continue to use light and translucent lines. 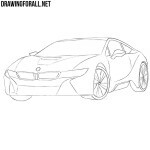 At the front part let’s sketch out the headlights, radiator grille and bumper lines. Sketch out the wheels and move to the next step. Using dark and clear lines draw out the headlights and grille with a large Mercedes sign in the center of the radiator grille. Using the long and curved lines draw out the hood. At the front draw the bottom of the radiator grille and the entire bumper. Continuing the line of the hood draw out a curved line of the roof, the lines of windows of our Mercedes AMG GT and a rear-view mirror. Let’s get to the door. Continuing the lines of windows form the door, erasing all unnecessary lines from the body of the car. Do not forget to draw an air intake in the side of the body. 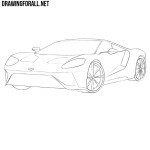 Using dark and clear lines draw out the wheel arches and wheels. Try to make the wheels most rounded. Draw the rims and our Mercedes-AMG GT is ready! It was a drawing lesson about how to draw a Mercedes-AMG GT step by step. 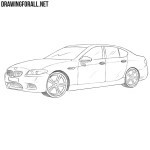 We have more and more tutorials about cars, and we are going to do even more similar drawing lessons. If you want some drawing lesson, do not forget to write it in the comments below this and other our articles or in our social networks.